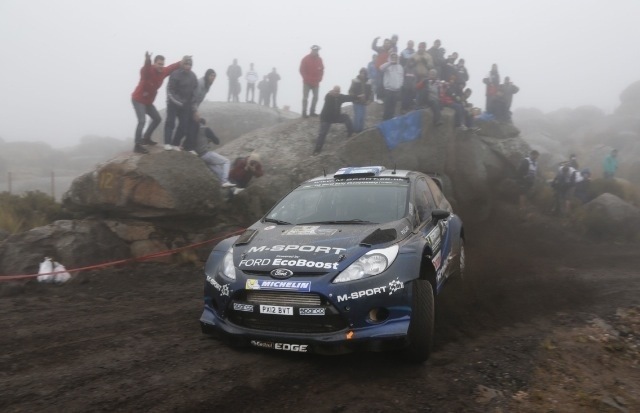 M-Sport World Rally Team’s Mikko Hirvonen reaffirmed his class as Rally Argentina came to a close with four stages to the west of Villa Carlos Paz today. In a bitter sweet turn of fortune, the Finn claimed three of the four stage wins to prove that he would have been fighting at the head of the field were it not for his uncharacteristic mistake on SS2. If the opening two days were not taxing enough, the final leg incorporated two legendary stages in the Valle de Traslasierra. Meandering through moonlike vistas littered with huge boulders and tight hairpin bends, ‘Giulio Cesare – Mina Clavero’ and ‘El Condor – Copina’ are demanding at the best of times. Combine that with the added complication of thick fog and mud, and today’s final stages provided what was arguably the biggest challenge of the weekend. Never one to pass up a challenge, Hirvonen was the man of the hour over the morning loop and looked untouchable behind the wheel of his Ford Fiesta RS WRC. Thriving in the tricky conditions, the Finn dominated the opening three stages. Fearless in the fog that blighted the opening speed test, the M-Sport driver was a full 36.4 seconds faster than his nearest rival. Thoroughly enjoying the tricky conditions, Hirvonen’s impressive pace highlighted the strength of his partnership with co-driver Jarmo Lehtinen. Driving to the notes with near-perfect precision, the pairing showed total trust in each other’s ability and reaped the rewards as a result. Setting the second fastest time in the points-paying Power Stage, the pairing also added an additional two points to their championship campaign. In the sister M-Sport Fiesta RS WRC, Evans and co-driver Daniel Barritt continued to develop their skills. Making it through all 14 speed tests unscathed, it was mission accomplished for the young Welshman who leaves his first visit to Argentina with a wealth of experience that will be invaluable in years to come. Piloting his Fiesta through some of the championship’s most technically demanding terrain, Evans showed real maturity and is now well placed to continue his progression at the sport’s highest level. “It’s not been easy to display good speed whist being safe at the same time and, for me, it has definitely been the most difficult event of the year. When you’re trying to learn a new rally you tend to settle into a rhythm as the event unfolds, but here, there is something new all the time and you are constantly learning how to tackle each variation. “With regards to the first day, the stages were very technical in nature and there was no margin for error. Yesterday was quite high-speed with a really soft surface so it was quite difficult to commit, and today the weather made things very tricky with mixed conditions within the stages themselves. “After my mistake on Friday we just wanted to finish the rally with a good pace and we were able to do that. Everything worked really well this morning. The boys clearly did a fantastic job with repairing the car and I was just able to really go for it. “I tried to enjoy it as much as I could and we had a really good time out there. OK, it didn’t work out so well in the Power Stage, but I thought that I should probably let someone else take a stage win today too! “Mikko [Hirvonen] did a fantastic job today which just goes to show the exceptional job that the mechanics did with repairing his Fiesta on Friday evening. He has always thrived in tricky conditions and I think that part of that is due to the strong partnership between himself and Jarmo [Lehtinen, co-driver]. They have complete faith in each other’s ability and that is just what’s required when the conditions are as they were today.